The Mandatory Housing Affordability (MHA) program rewards developers and speculators, while Seattle residents pay the price. 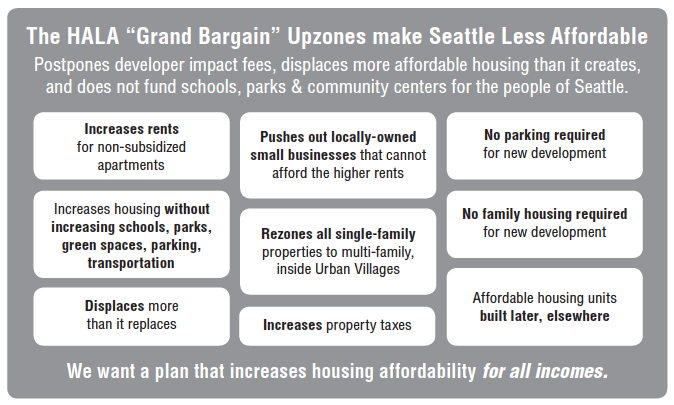 This “Grand Bargain”, devised by Seattle’s Mayor and City Council, promises to destroy established communities, displace thousands of low- and middle-income residents, and reduce family-scale housing options. Importantly, MHA doesn’t guarantee affordable housing concurrent with new development in affected neighborhoods. 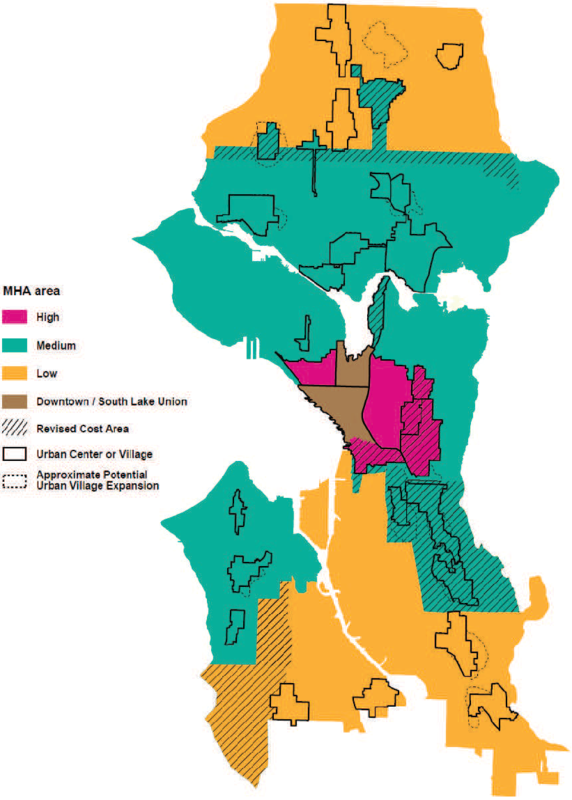 The MHA program applies to all multifamily zones in Seattle. In Urban Villages, all single-family properties will be rezoned to multifamily. In exchange for providing a minuscule number of new affordable housing units, MHA allows developers to build larger and taller buildings. Currently affordable old housing units will be torn down to provide market rate housing that only high income earners can afford. Every new MHA building will increase the cost of housing in Seattle. The City conceived MHA with negligible input from current residents. Economically and culturally diverse Urban Village communities will be disrupted and driven out by high-priced new development. All residents will face overcrowded schools and public transportation, trampled parks, clogged streets and parking, and more frequent pollution from sewer overflows. Yards, trees, and green spaces will disappear. The City has neither plans nor funding to address MHA impacts. Since Seattle does not see fit to collect impact fees from developers, all Seattle residents will be stuck paying for the negative impacts of increased housing density. This is why everyone needs to get involved! Read the WCC Position Paper on Affordable Housing, Increased Density, and Livability in Wallingford. See the Mandatory Housing Affordability (MHA) Myths & Facts page. Stay informed! Join the Wallingford Community Council (WCC), your neighborhood community council, and other groups concerned about the MHA program. Display a WCC “Keep Seattle Livable” yard sign to show your support. Guide to Housing Options. Be aware of the “examples are for general illustration purposes only and are not intended as technical representations of proposed zoning standards” disclaimer. A summary of the MHA zoning changes is given in the table below. MHA Zone differences are shown in crimson. MHA Zone differences are shown in crimson. UC & UV = Urban Centers and Urban Villages. Parking Required: 1 space per unit; none required in UC & UV. The MHA proposal creates three tiers of MHA requirements for multifamily residential and commercial development based on location in a Low, Medium or High Area and whether proposed zoning increases moves a zone from one category to another. The MHA performance requirement is a percent of units that must be set aside as affordable housing, or alternatively, a payment contributed to the Seattle Office of Housing. Fractional housing units are rounded up to the next whole unit. The developer may pay for the fraction to round down instead. Cost is dollars per square foot ($/SF) based on the Gross Floor Area, which is the product of the Lot Area multiplied by the maximum Floor Area Ratio (FAR). Category 5+ Zones with heights greater than 85 feet. The City is not clear on which category includes Neighborhood Commercial 40 (NC-40), and which category includes Neighborhood Commercial 95 (NC-95). If a rezone results in no change in category, the zone would receive a standard M suffix. If a rezone resulted in a zone changing to the next highest category, then the zone would receive a M1 suffix. If the rezone resulted in a zone changing by two categories or more, the zone would receive a M2 suffix. The proposed map shows where the MHA High, Medium, and Low performance requirements apply. A summary of the MHA development examples is given in the tables below. MHA Zone differences are shown in crimson. MHA units factor = Number of units with MHA zoning / number of units with existing zoning. * Parking greater than required.